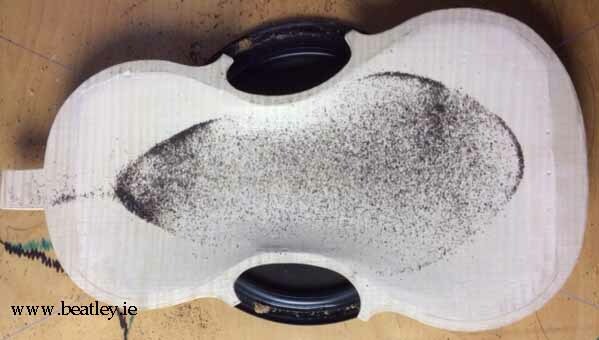 In violin making Eigenmodes frequenies measured in hertz (hz) are a reference to the stiffness of the wood. So when making a front or back the stiffness both along the length and across the width are important. You can feel the stiffness in your hands by flexing the wood which is the traditional way of knowing how stiff your work piece is . 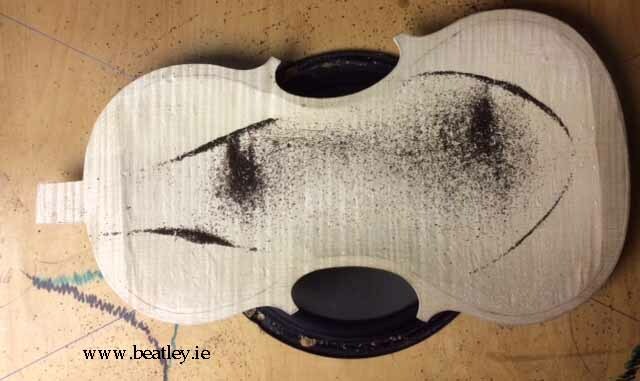 Makers often balance the violin plate on the thumb and tap the edge of the plate at the lower bout, this tap tone or frequency of vibration represents the twist as in flexing the plate held at top and bottom and twisting in opposite directions. Although it is a reference it is better to measure the stiffness across the bout and lengthways. 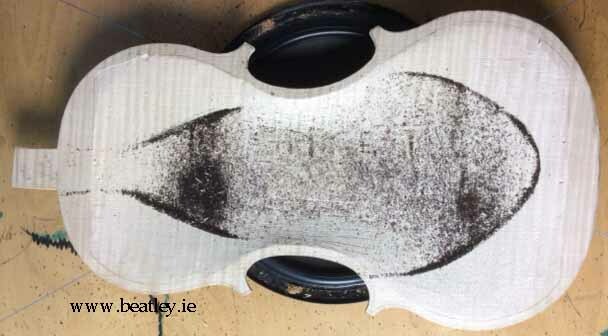 Below are images of a back being tuned violin No:108 to match the front which has been made complete with bass bar fitted and sound holes cut. In short Carleen Hutchins paper on free plat tuning states you need to have mode #5 and mode #2 in both the front and back plates agreeing within one full tone. Mode #2 should be the same in the front and the back but mode#5 be out at least a semi tone and agreeing within a full tone. it is most important to have mode #2 which is the stiffness across the plates matching as close as possible. My targets to finish at are Mode #2 which represents the stiffness across the bout to be 181hz F + 7 hz. This is what I have finished the front to with the bass bar fitted and ff holes cut. Finish the front then make the back match the criteria. 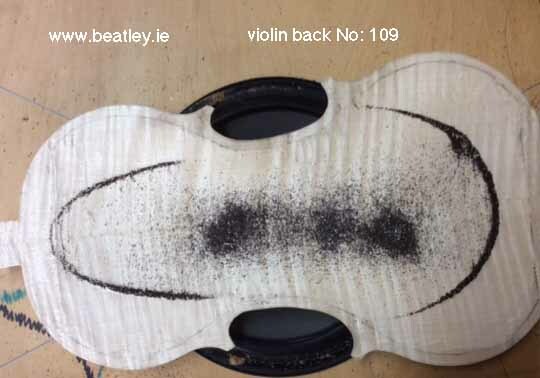 Below are three images of the back being tuned. Here the Chladni pattern is coming in to form a horse shoe shape and the frequency has come down closer. After removing a little more wood in the upper bouts the pattern is right. Now I will keep removing wood all over until I get within a semitone of mode#5 in the front. it should be centered at the lower block area when testing. In this plate No:109 the chladni pattern is extended further into the upper and lower bouts compared to No:108. This plate is tuned a semi tone lower and 11 grams lighter. This violin will be louder under the ear than 108 and will play very easily. No: 108 will project better because the plates are stiffer. The tea leaf patterns or Chladni patterns are important to have the correct shape. These are also known a nodal area's . They show the area where the wood bends or where their is no movement. To make an analogy you will be familiar with an oscilloscope as seen on the tv medical soaps. Your heart beat is represented by a wave which oscillates up and down and the straight line your dead. 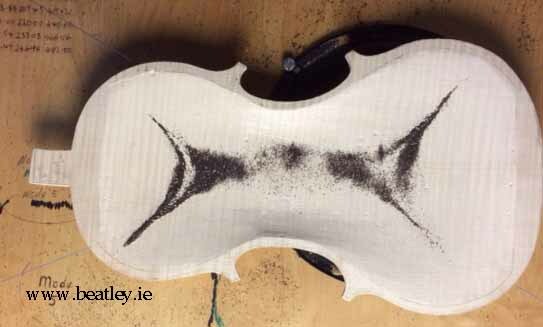 This straight line is the nodal line which does not move but is still their in the oscillating wave, in the violin plate it is the bending of the wood so one side of the line may be down the other is up and vice versa. It is important to have the Chladni patterns running off in the correct area. When doing the tests particularly mode #5 which is fairly high frequency you must wear ear muffs and no pets present the bounce of the tea leaves on a lively plate will bounce over 75m.m. I like to see this and if the bounce is low I may lower the frequency a bit to make a more lively front plate. F or 349 hz is a good target to go for. Higher than this but not higher than G will project well , lower than F will still be loud under your ear and easier to play but will not project as good. Return to shop.